The following letter has recently been purchased by Nuneaton Museum and Art Gallery and its pubIication here (as far as we are aware, for the first time) is with the Curator's kind permission. Unfortunately, no year is shown with the date, neither is the correspondent addressed in any other way than by 'My dear Sir', so it has been impossible to discover to whom it was written. All one can say is that it was penned sometime between 1890 (the date of publication of Oscar Browning's Life of George Eliot) and 1925 when Sir Thomas Clifford Allbutt, the writer of the letter, died - a very long span! T. Clifford Allbutt (1836-1925) met George Eliot in 1868. In 1864 he had been appointed physician to. the Leeds General Infirmary. and George Eliot and Lewes spent two days looking around the new hospital with him. He was the inventor of the clinical thermometer and was once thought to have been the original of Lydgate in Middlemarch, although much more successful than the hapIess character in the novel. 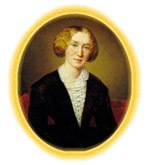 I saw a good deal of George Eliot in the years to which you referred and she would pick up a good deal from me and others about young men in their early medical years. And Lewes being himself a physiologist and often associated with medical men would tell her much and say much before her. Among Lewes' and her friends were Lockhart Clarke, W. F. Parker, (of the "shoulder girdle” ) Gardiner (1) of your own town and many others. It was often laughingly said among us that I had sat for Lydgate but this was only banter. She constructed the character as great imaginations can, out of very limited data as Owen constructed the ( see …) etc.